The 3.5 Seas is intended to be a digital board game about rival explorers competing for Royal Favor by attempting to be the one to explore the most Small World. Originally, I developed this game for Ludum Dare #38 but didn’t finish in time. In addition, they may move around on the explored ocean tiles each turn, depending on what sails their boat has and the wind. Essentially, wind gives +1 move in the direction of the wind, -1 move in the opposite direction. I had great plans for allowing you to hire crew, and then leave them on islands to work, or give you additional bonuses while exploring. You’d be required to eat pay or feed the crew, or maybe both - it hadn’t been fully designed. The idea was that you’d have to return to where you dropped them off in order to pay or feed them, or else they’d leave. If you couldn’t feed / pay your crew onboard, there’d be a mutiny forcing you to move towards the nearest port - with each unfed crew leaving your ship once you reach port. Other ideas included leaving crew in port to be picked up by your rivals and spy the tiles they explore until they get dropped off at the next port. In addition to crew, you’d manage islands. After they’re discovered, the people on the island produce whatever the island tile dictates, forming an economy where they sell produced items, and try to buy food or tools. 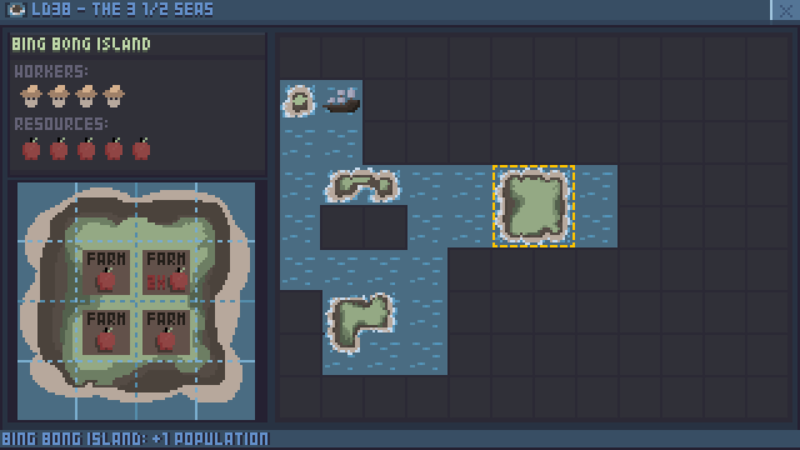 The player would be able to ‘buy’ squares on islands and convert them to their own type of production so they could influence trade. Before 3.5 Seas was more fleshed out, it began as an idea I called “Pirate Tiles.” In the same vein as Carcasonne, Pirate Tiles is a tile-laying digital board game at it’s heart. Each turn, players place tiles that represent either ocean or land masses, in an attempt to complete and claim the most discovered islands. Tiles are picked and shuffled randomly (# TBA), and each player is dealt 3 tiles at random in addition to an ocean starting tile. Each player picks a corner of the play area, places their starting tile and then boat on top of it. Players move their boats around the board, but only on Ocean tiles. They may move Left/Right Up/Down but not diagonally. Each turn, they move one. A Player may lay a tile adjacent to their boat, including diagonally, if the tile can be placed legally. 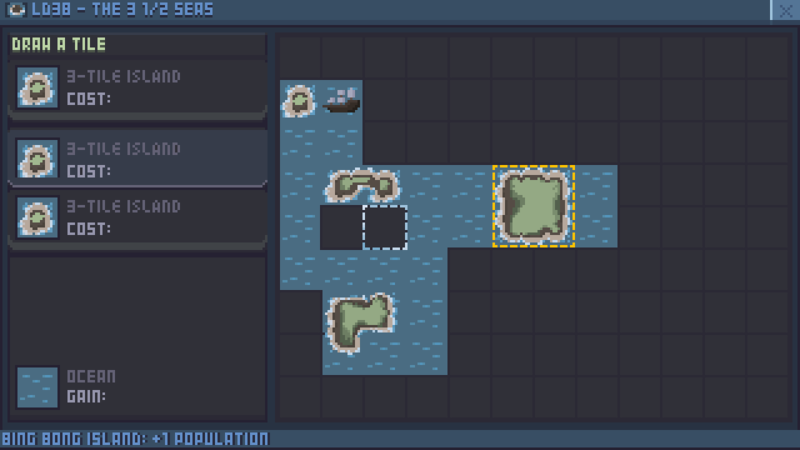 If a tile placed ‘Completes’ an Island, the player scores 1 point for each island tile of the completed island. The Game Ends when either the ‘deck’ of tiles is exhausted, or the entire board has been filled with tiles. Since we’re a digital board game, it’ll end early if there are no legal moves left within the undrawn tiles. Scoring is simply tallying the most completing island points. Spells, like Unleash the Kraken could also be drawn from the tile deck, giving players bonuses, i.e., Unleash the Kraken allows players to place a Kraken on an ocean tile, making the tiles around impassible for X amount of turns. This leaves room for movement bonuses, or teleports, or other various things I haven’t thought of yet.